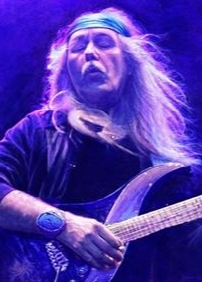 Electric guitar virtuoso Uli Jon Roth got his start with The Scorpions, playing on the band’s early studio albums including Fly to the Rainbow, In Trance, and Virgin Killer, and the live album Tokyo Tapes. Eager to explore a more expansive direction, Roth left The Scorpions in 1978 to form Electric Sun, which released a trio of albums. His musical journey then took him in a more classical music direction, which continued until he returned to the rock format for the G3 guitar tour in 1998. More recently, Roth has gone back to his hard rock beginnings with the release of Scorpions Revisited in 2015 and Tokyo Tapes Revisited: Live in Japan in 2016. This interview was for a preview article for noozhawk.com for Uli’s concert at the Majestic Ventura Theater on 2/19/17. It was done by phone on 1/28/17.